This color view of the asteroid Gaspra was produced by combining three images taken through violet, green, and infrared filters by the Galileo spacecraft on October 29, 1991, from a distance of about 16,000 kilometers. The surface is covered with rocks that are somewhat less gray than those on Earth's Moon. 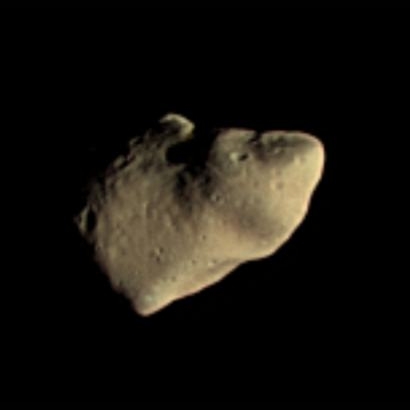 The colors were enhanced to bring out the muted color variations on the asteroid and to increase the ability to discriminate between surface features. The subtle variations in color may be due to slight differences in rock composition or to differences in the texture of the surface layer. Gaspra is about 19 x 12 x 11 kilometers and irregular in shape.